We all long and wish to be recognized and complimented for anything we manage to accomplish successfully. A certificate of achievement is one of the best ways to make this wish a reality to people who have made great effort and have successfully met their intended goals. Whether in school, sports, companies or various other institutions, certificates of achievement help boost the confidence of those they are presented to. It also motivates them which will propel them to meet even greater goals. What Different Certificate of Achievement Templates are Available? They come in various designs to appeal to different artistic tastes people may have but the most important aspect in a certificate of achievement is the wording. The wording is what will distinguish the certificate from any other certificate and the recipient from anyone else. It also shows exactly what odds the recipient has beaten by highlighting their achievements. It is important to begin with the title of word which can be ‘Certificate of Achievement’ like is most commonly or even the specific achievement the recipient has achieved for example ‘Best English Student of The Year’. Preferably, this should be written in bold to easily capture the attention of anyone looking at it. Before the recipient’s name, the line ‘Presented To’ should be included to help identify the person or even institution being identified with the award. The recipient’s name should then follow most preferably in bold to also capture the attention of anyone looking at it. It is advisable to write the official names of the recipient and not their nicknames because the certificate is an official and legal document and will therefore be recognized in formal settings. To congratulate the recipient, a short sentence should be included after the name to show this intention. For instance, the sentence can read like ‘Congratulations for Your Outstanding Achievement in’. Lastly, the date on which the certificate will be presented should be included together with space for a few signatures to make the certificate legal and recognized and the name of the organization providing the award. The signatures should be signed by officials in charge of giving out the award to ensure its authenticity and avoid cases of fraud. Various font styles are used in the wording of certificates of achievement but it is important to ensure that the selected text is easily legible and the letters are clearly written to avoid a situation where the information cannot be read and therefore not understood clearly. The design should also be well thought-out to ensure the certificate is attractive. Here is a great example of a Certificate of Achievement Template – You can see, highlighted in yellow the area’s that can easily be customized and changed to create a unique and perfect certificate. The template, can actually be downloaded freely from here. 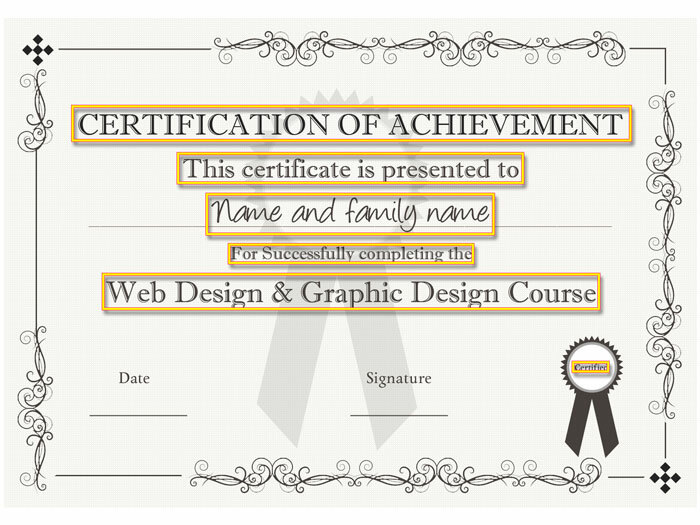 Certificates of achievement help build a person’s reputation and may be useful especially when seeking employment or certain positions and therefore should be made carefully as they speak a lot about the recipient. They should be taken care of because they do not expire and remain effective as long as the recipient continues to exist. These are the major steps that should be considered in creating an effective certificate of award that can effectively appreciate the achievements of people who deserve it.